This is a paws Polyester gloves, it applies to parties and performances, very realistic. Just began to use, it has some emulsion flavor, but you don't have to worry about it, because it is harmless. You just need to open a few days, the smell will be reduced. Its hair is likely to come off, but will not affect the use. High quality eco-friendly material, harmless for skin. Comfortable and stretchy, shrink, durable, easy to carry. 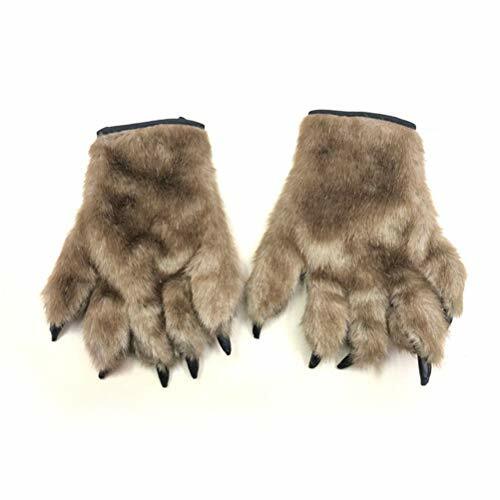 Horrific paws, great for pranks gift, making funs for you and your friends. Carnival, Christmas, Easter, Halloween or any other parties.